Includes FREE $19.99 value 74 minute instruction video! 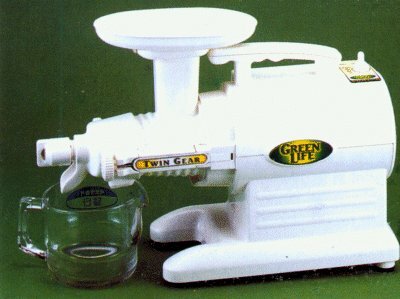 Tribest, the manufacturer of the Green Life, Green Power and Green Star juicers has discontinued the Green Life Juicer. 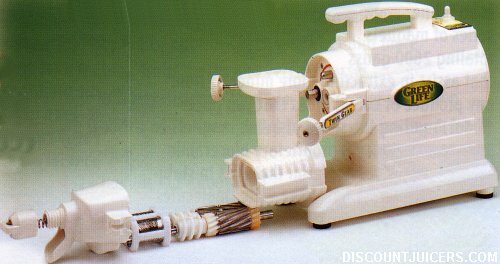 The Green Star Juicer is the exact same machine which also includes the pasta and mochi maker. Click here to view the new Green Star Model. Green Life has exactly the same capability and features as the Green Power model, including magnetic and bioceramic technology, but with a stronger, more compact housing. Only some of the extra attachments, like the Mochi Maker, and the Pasta Maker are now optional accessories to enhance affordability. The Green Life juicer is 3 machines in 1. The Green Power Juice is still available with mochi and pasta makers included, which makes it 5 machines in 1. Other juicers and blenders with fast rotating blades can destroy a substantial amount of nutrients in fruits and vegetables due to the heat during the operation of the machine. With your GREEN LIFE juice extractor, you can minimize the loss of nutrients. Because GREEN LIFE juice extractor has the unique triturating twin gear feature which is an impeller press system, its powerful low r.p.m Turning speed generates virtually no heat to your juice and thoroughly crushes and presses fruits and vegetables, instead of cutting and shredding them into small pieces. It separates pure juice from harmful pesticides and heavy metals which might be present on fruits or vegetables. 3. Capable of juicing leafy vegetables with tough fiber. Most herbs and leafy vegetables with tough fiber are difficult or nearly impossible to juice with other juicers or blenders. Now from the moment you start using GREEN LIFE juice extractor, you can easily juice these including wheat grass. GREEN LIFE uses strong magnets and a bio-ceramic material in its twin-gear system to produce fresher juice which can be stored for a longer period of time: some people report storing the juice for up to 48 hours in the refrigerator because of delayed oxidation. GREEN LIFE juice extractor is very quiet when in use. The impeller press system of twin gear enables you to enjoy continuous juicing. You can easily disassemble this machine for cleaning with the brush included in each box. Green Power, Green Life, Green Star? Want to know which to buy? juices with a wide variety of fresh fruits and vegetables. juices wheat grass, herbs, sprouts and other leafy greens. homogenizes, makes baby food, nut butters, frozen fruit sorbet and more! makes Japanese rice cake (mochi), bread sticks and cookies. makes pasta in 2 different shapes. 1. Super twin gear triturating and squeezing power, equivalent to 4HP. 2. One-step continuous juicing with automatic pulp ejection. 3. Juices all vegetables and fruits. 4. Juice can be stored in a refrigerator long periods of time without losing nutritional value. 5. Heavy duty construction using highest quality materials. 6. Ejected pulp is dry indicating maximum juice extraction. mochi* (Japanese rice cake), and an interesting variety of other delicious food. 8. Easy to disassemble/assemble and clean. 9. 110 rpm rotational speed for low heat and noise. 10. Reverse turning safety feature. 11. Built-in convenience cord storage. * Optional Parts may be purchased separately. When you purchase the Green Life Juicer from us, we will also include a 74 minute instruction video to get you aquainted with your new purchase. This is a $19.99 value, we are the first to offer this instructional video with the juicer FREE! Click here for further information on the video.